The RB8 is the fourth evolution of a concept started by Newey and his team with the RB5 in 2009. It turned out to be a rather complex evolution however as the modified regulations required the team to remove the blown diffuser and re-think the car's concept, knowing that the RB7 was designed around that exhaust layout from its inceptiont. Red Bull had pioneered and optimised this as no other team managed to do, and hence they were hit harder than any other team. To clamp down on the ever increasing downforce, the FIA specified an area where the exhausts could exit, removing the possibility to have them positioned very close to the car's floor. One other regulation change limited the height of the nose, and just like with many other teams, the RB8 features a stepped nose. Uniquely however, that step was exploited by the team to build in an aperture for driver cooling. The car was launched online, the evening ahead of its testing debut at Jerez on 7 February. Despite some fog in the morning, the car got shipped properly and Mark Webber managed to do 54 reliable laps with the new car. It soon showed however that the car was not as strong as its predecessor, and Newey soon publicly revealed he was very impressed with the Lotus E20 and the Sauber C31. While the Lotus featured a fairly classic exhaust system similar to the RB8, with the exhausts exiting close to the centreline of the car, the Sauber had a unique downward slope on the sidepods, exploiting the Coanda effect to channel the exhaust gases down to the floor, into the area where the exhaust pipes exited in 2011. The early version of the RB8 lacked a solid balance, and it was later revealed that this was likely due to Red Bull having to drop an ingenious exhaust redirection system. Early in 2013, Newey said the team had worked on a channel legally positioned behind the rear wheel axle line - as the regulations only initially restricted exhaust-influenced bodywork ahead of the rear axle. The layout was going to look like a brake duct, catching exhaust gases before guiding them towards the diffuser. Mercedes AMG however pointed out the loophole in the regulations to the FIA, which then adhered the regulations to prevent any exotic designs that could have resulting from that. Sadly for Newey, this required the team to scrap their system, which he says was quite far advanced in its design, albeit that no parts were produced yet. Moving on from the banned layout, the team started working feverishly on a Sauber-like exhaust ramp. Even though Newey admitted the effect was just a fraction of what could be achieved in 2011, also partly because of limitations in the engine mapping, it was worth looking into. Only at the final test ahead of the season, Red Bull debuted a new chassis at Barcelona, featuring a similar design to Sauber. The layout uniquely featured a channel underneath the sidepod to feed the centre of the diffuser. The team continued to develop the layout, exploiting more and more downforce. At the first race of the season, there was already a revision, with further iterations focusing on improving the bodywork around the exhausts, while also extending the inlet to the channel. It is believed that the initial version of the channel was very inefficient with the team unable to catch enough air to feed the diffuser. Despite many improvement, the car still wasn't the fastest of the field and recorded just 3 wins in the first 13 races, a pale display compared to the Red Bull RB7. At Singapore however, Red Bull brought in an update that would prove decisive in the championship. The car suddenly was a lot stronger, allowing Vettel to record 4 consecutive victories. A new 'rubber' nose, improved wings and a double DRS system - ducting which fed the beam wing to stall it at high speeds - were all part of this, exhibiting the team's technical dominance in Formula One. At the end of the season, Vettel became World Champion for the third time in a row, along with the team. 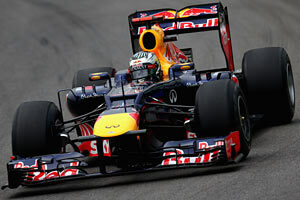 The RB8 recorded 7 wins and secured the constructors' title with a 60 points margin over Ferrari.